Published on March 11, 2016, 12:56 p.m.
Saturday, March 5, 2016. I woke up around 4:30am, and we drove out into the middle of nowhere in southern Mississippi. We arrived around 5:30am, and people were already lining up for the 6:00am start. It was 40°F, but the high for the day was supposed to hit the low-mid 70's. 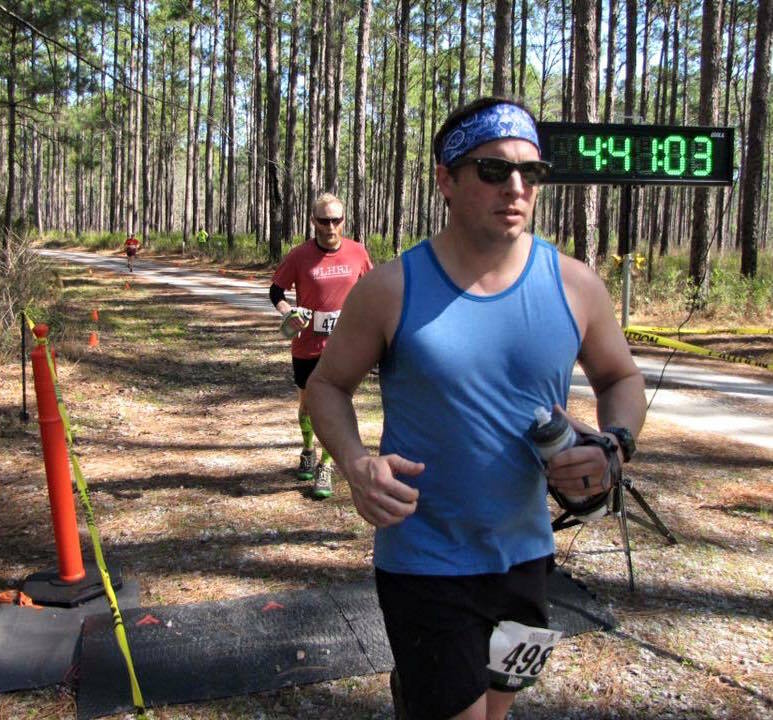 This was the Mississippi Trails 50. 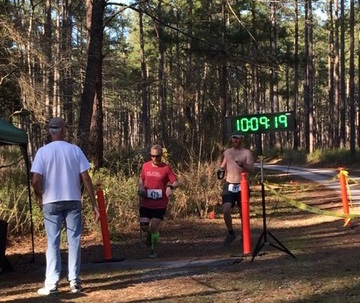 I'd run my first 50k in mid-January, but this was my first attempt at a 50-miler—a staple of the ultra-marathon trail run. As far as trail runs go, the MS50 is fairly easy terrain. It's essentially a horse trail through a huge, beautiful pine forrest. There are gentle rolling hills, the ground is soft, and the trail is wide. You could easily run 3-4 abreast nearly the whole way. However, there is water, and there is mud. I think there were 4 creek crossings, and while they weren't huge creeks, they were large enough that you have to wade through them. Which means your feet are going to get wet. On either side of those creeks are large mucky, slippery, muddy patches that seemed to disappear and then suddenly reappear another half-mile past the creek. I'm no stranger to muddy trails, but in this case, I could've done without. The MS50 is a series of loops around a 12-mile trail and a 6-mile trail. The 50-mile course ran for 3 of the 12-mile loops and 2 of the 6-mile loops (yes that's 48 miles total. I'm still calling it 50). There were aid stations every 4-6 miles packed full of great treats: chips, cheeze-its, goldfish, brownies, peanut butter and jelly, M&Ms, Coke as well as water and Heed. Every aid station was run by enthusiastic volunteers who made the day a great one. Many many kudos to those folks. I don't think I could have survived without them. Loop one (12 miles): man I feel good! This forest is beautiful, look at all these pine trees. Wow that water was cold, but man I'm energized. I've got to get another one of those brownies! Loop two (12 miles): alright, 12 done. My legs are feeling good pretty good, I'm not too tired. That PB&J was delicious. I can do this. Why oh why didn't I ditch this top after the first loop, it's freaking hot. Loop three (12 miles): Ugh. I have to run this loop again. Man I hope Von doesn't run off and leave me. Where the f*3k did these hills come from. (at mile 32) Woah, in 2 more miles I'll have run further than I've ever run before; I'm actually going to do this. (at mile 34) Hell yeah! I guess I've got my second wind, I'm feeling good again! Loop four (6 miles): Oh man, there's something wrong with my toe. I can't believe my IT band isn't killing me. Ugh, I can't possibly eat another brownie and those chips look awful. Loop five (6 miles): uh, I wonder if I'll still make the cutoff if I walk this whole thing. My toe stopped hurting, I hope that's not a bad sign. Just jog for another mile. I still have Gu, have I really only had 2 this whole race? Oh man, I recognize this trail, we're only a mile from the end, let's do this! I just can't imagine doing an event like this without friends, and I was lucky enough to accompany Brian, Von, and Lynn on this journey. We all started the race together, and Von and I paced each other for the first 34 miles. Brian has been my training partner for so long, and were it not for him I would never have even considered doing anything like this. Thanks bud. As a general rule, I think trail runners are a pretty friendly lot, and I ended up running the last 12 miles with a guy named Brandon. I'm pretty sure he was faster than me, but he seemed to like the company. Twelve miles & a conversation feels shorter than 12 alone. Wherever you are, thanks, man. I crossed the finish line after 10 hours and 9 minutes. This was the most physically challenging thing I have ever done in my life. It felt amazing. My Bolle sport glasses with Rx / Transitions lenses. 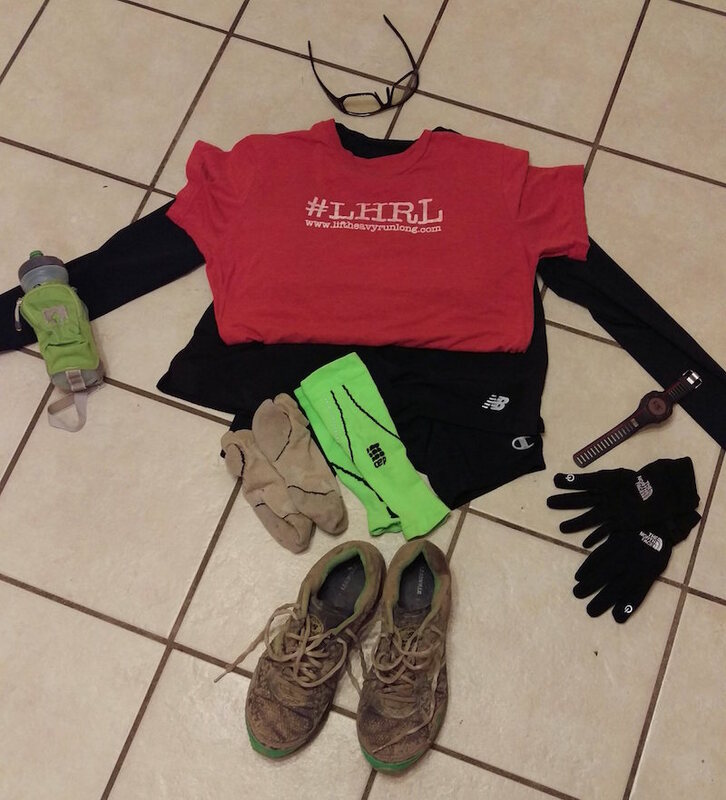 Most of my gear for the first two loops of the race. I shed the long-sleeves later, and the CEP knee strap is not pictured. I'm lucky to have friends that enjoy this activity. They make me better, and help me push my own limits. I've technically be training for this race for the past year (even though I didn't realize it at the time). Sun: A "long" (10+ miles) run. Tues: Hit the gym in the morning. 5x5 Squats followed by a 10-15 minute conditioning workout. Thurs: Gym: 5x5 Overhead press or bench press + 10-15 minutes of conditioning. Fri: Gym: 5x5 Deadlift + 10-15 minutes of conditioning. Sat: Bike ride (30-50 miles) or "long run". That's a pretty typical week for me. Some days get moved around, and sometimes the weekend workouts get cancelled (at which point they become a rest day), but for the most part, that's my routine. Now about diet... in July-August of last year I did my first Whole30. I've been doing semi-paleo for a while, but I feel like that first Whole30 really had a huge impact. I also happened to be running the MRTC Road Race series at the time, and tagging along with Brian's weekend Half-Ironman training routine. I'm sure all of these things had an effect, but it was during this time that I PR'd my 10-mile and half-marathon races. I ran faster than I ever imagined I could run, and I felt great. I did another Whole30 during January 2016, and I ran my first 50k during the middle of that. I was amazed at how well I felt for most of that race. A whole30-style diet works pretty well for me. I'm not currently staying compliant (I at chocolate chip cookies yesterday! ), but for about ⅔ of my meals, I eat lots of veggies lean cuts of meat (or eggs) and I often finish with a bit of fruit. If you're curious about how I eat, well I've got a tumblr for that. It's now Thursday, and I feel 100% again. The day after the race was pretty miserable. My legs had a lot of soreness two days after, but I hit the gym and did an upper-body workout. On day three, I did deadlifts at the gym and the soreness was basically gone, though I did have a pretty major blister on my toe that was bugging me. Aside from the distance & speed, one my criteria for a successful race is, "to not feel like I'm going to die afterwards". I feel like I've been lucky to achieve this with both of my ultras. If you'd told me this time last year that I would have finished a 50-miler, I probably wouldn't have believed you. I'd always thought about the 50k, but 50 miles is a long way. It's pretty amazing what you can accomplish with consistent training, a good diet, and amazing friends. See you on the trails.